When even party politics finds itself dressing up in outlandish outfits and pretending to be a superhero in order to convince grown adults to exercise their democratic right to vote, that's probably a pretty good sign that geeks really have taken over the world. How else to explain the presence of Campaign Boy and Campaign Girl at last week's Comic-Con? Straight from their headquarters at Campaign.com, the pair has the tools to help Americans exercise one of their greatest superpowers - voting. 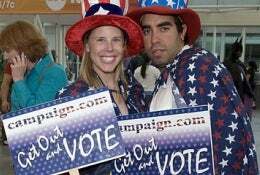 Campaign Boy and Campaign Girl are armed with information on voter registration, the candidates, and the issues to help voters determine the fate of the universe. Fate of the universe? What do these two superheroes know about the Obama vs. McCain clash that the rest of us don't?